We did this cruise with friends on their first cruise. Quite the experience. First the good: we were in 6640, balcony cabin. Embarkation was quick easy and painless! It was very nice, good location and the bed was great. We didn&apos;t mind the lower half of balcony obstructed. The promenade deck was just below us with all the fun stuff and coffee shop! The staff were polite and friendly for the most part. The comedy shows were excellent and so was the ice show. This was our 9th cruise and with husband&apos;s retirement in a year we are looking forward to more! So to the negatives: The staff in the main dining room where we ate every night was pretty out of sync. The waits were long, food was either cold (in the beginning, they did do better later) wine was very slow as well. I got the feeling they were short-staffed. It was just chaos the first two-three nights. There was no Somalier so the wait staff brought wine - also very slow in the beginning. Getting info on just what was allowed on the drink package in the bars was also a big problem on the first day. The coffee in buffet and dining room was awful. Thank goodness for the drink package where we could get Starbucks every day. We also were on special diets because of health issues. Low carb, which means no bread, rice, potatoes, crackers, cereals. The cruise ship caters to regular eaters - I understand, but the lack of variety got boring. Carrots and broccoli every single night. The next big problem we had was the fact that on the last day was we were in a hurry to disembark to catch a flight - we had to deal with the ship charging us for drinks they claimed we were "sharing"!! No one asked us if we did this (we did not! ), they just stuck it on our bill. This is such poor customer service! The buffet was also a problem in that apparently the workers in there are strictly for bussing tables. They do not bring coffee, water or flatware. So then you have to go back up to where there are tons of people with food plates and get all up in that mess again. Seems like this is a poor way to do it. The buffets are crowded enough without all the flatware being up there too. We had a few other problems too but the lack of service and the trying to sneak a charge on our bill really made me angry. We did this cruise with friends on their first cruise. Quite the experience. First the good: we were in 6640, balcony cabin. Embarkation was quick easy and painless! It was very nice, good location and the bed was great. We didn&apos;t mind the lower half of balcony obstructed. 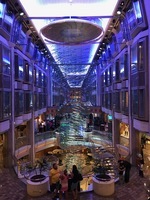 The promenade deck was just below us with all the fun stuff and coffee shop! The staff were polite and friendly for the most part. The comedy shows were excellent and so was the ice show. This was our 9th cruise and with husband&apos;s retirement in a year we are looking forward to more! So to the negatives: The staff in the main dining room where we ate every night was pretty out of sync. The waits were long, food was either cold (in the beginning, they did do better later) wine was very slow as well. I got the feeling they were short-staffed. It was just chaos the first two-three nights. There was no Somalier so the wait staff brought wine - also very slow in the beginning. Getting info on just what was allowed on the drink package in the bars was also a big problem on the first day. The coffee in buffet and dining room was awful. Thank goodness for the drink package where we could get Starbucks every day. We also were on special diets because of health issues. Low carb, which means no bread, rice, potatoes, crackers, cereals. The cruise ship caters to regular eaters - I understand, but the lack of variety got boring. Carrots and broccoli every single night. The next big problem we had was the fact that on the last day was we were in a hurry to disembark to catch a flight - we had to deal with the ship charging us for drinks they claimed we were "sharing"!! No one asked us if we did this (we did not! ), they just stuck it on our bill. This is such poor customer service! The buffet was also a problem in that apparently the workers in there are strictly for bussing tables. They do not bring coffee, water or flatware. So then you have to go back up to where there are tons of people with food plates and get all up in that mess again. Seems like this is a poor way to do it. The buffets are crowded enough without all the flatware being up there too. We had a few other problems too but the lack of service and the trying to sneak a charge on our bill really made me angry. Cabin was very nice. Plenty of room for our stuff. Suitcases emptied and stored under bed. The shower had a sliding door which we liked (the curtains tend to be a problem). There was an odor in the bathroom at times. Maybe just an aging plumbing system. The bed was very comfortable. This balcony is not glass so you have to sit up in bed to see out, but we didn&apos;t mind.